Luxury Vinyl Flooring also known as the short version LVF – can also be heard in the industry as LVT – Luxury Vinyl Tile. This flooring is just FAB! It looks like wood, feels like wood, and longer lasting than wood! Those days of mess and dust of removing your existing tile are over!! This 100% WATERPROOF product comes stamped with a lifetime residential warranty and the best part out of this flooring is the fact it can float on top of your existing floors! I can’t express the installation aspect of this product verses the traditional ceramic wood tile. Night and day! The LVF installation would take half as less time to install tile and/or wood…and did I mention WAY less mess of the removal of tile and grout! Let’s say you’re going to sell your home in the next few years…you can float this LVF flooring over your existing floor with a 3-in-1 pad. When it comes time to sell, let your buyers know they have the option to leave the LVF or easily remove it for the original existing floor. What a GREAT selling point and option for your future buyers! 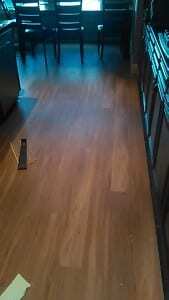 I will show you in person how this flooring will look in your home or office with a free estimate. Call me TODAY (813) 645-1201 to come out and give you a free demonstration of the LVF flooring.